Everyone wants to have a high-wattage smile; one that shines as bright as the stars. Unfortunately, not everyone is lucky enough to be born with one. Whether due to extrinsic or intrinsic factors, teeth can display a disappointing shade. At Ria Family Dental we can help. A brighter smile is within your reach with our teeth whitening options. 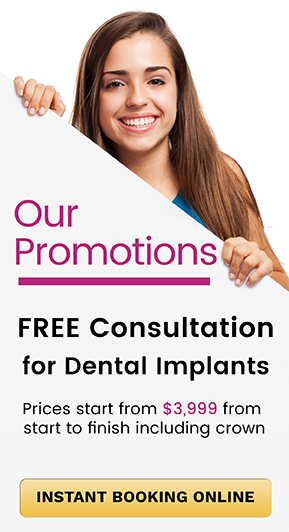 Get your brighter smile today! Your teeth are exposed to different things that can discolour them. Keeping your teeth bright and glowing can be very challenging. The first step towards better looking teeth is understanding the common culprits of staining and darkening. If attended to immediately, most causes of tooth disclouration can be reversed with proper oral hygiene and regular dental scale and cleans. If neglected, the stains can harden requiring teeth whitening to remove. The good news is that Ria Family Dental is experienced and expert at whitening your teeth! Teeth whitening is a non-invasive, routine, and effective dental treatment that improves the shade of your teeth to increase the beauty of your smile. Teeth whitening has a number of benefits. In fact, a recent study from the universities of Leeds and Central Lancashire confirms that a brighter smile makes a person more attractive. The best candidates for professional teeth whitening have healthy teeth without fillings or restorations, and healthy gums. Patients whose teeth are yellowed are more likely to respond to treatment. Tooth whitening treatment is not safe or effective for anyone. At Ria Family Dental, we have in-office teeth and take-home teeth whitening options for our patients. In-office teeth whitening is the most popular cosmetic dental procedure in the world today. 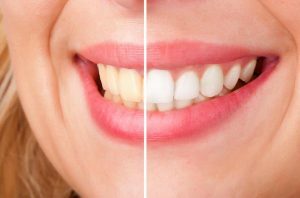 In–office whitening is performed under carefully monitored conditions that allow for the safe, controlled, pain-free use of a relatively high concentration of bleaching gel – yielding results that are visible immediately. Less economical than take-home alternatives. In-office whitening is not a permanent solution. Many dentists recommend a home maintenance follow-up program to be practiced at home. Professional at-home teeth whitening kits are obtained from your dentist and they contain a high concentration of either hydrogen peroxide or carbamide peroxide. Custom-fitted dental trays are created to hold the whitening solution on the surface of the tooth and reduce exposure to the other parts of the mouth and/or digestion. Impressions are made of both your upper and lower teeth. The impressions are sent to a lab to create trays for the whitening agent. This takes approximately one to two weeks. When the trays are constructed, you will be shown how to properly apply and dispense the solution, as well as other instructions required for good results. Before starting the at-home procedure, you would need to brush, floss, and rinse completely. The procedure itself is typically performed an hour per day for two weeks, Certain brands can be worn overnight. You would need to avoid eating, drinking, or smoking while wearing the trays and continue to do the same for 30 minutes after. After two weeks of treatment, a follow-up appointment is made to assess your results and see if your teeth are becoming the brighter shade you seek. Additional whitening agent can be used for touch-ups if deemed necessary. Enjoy life’s best moments better with brighter teeth and a stunning smile. Talk to your Ria Family Dental dentist today to experience our teeth whitening options. There’s nothing more we want than to give you the smile you deserve. When it comes to providing you and your family with quality dental care in a friendly and warm environment, Ria Family Dental can’t be beat. From routine dental procedures like checkups to complicated dental needs like implants and root canals, the Ria Family Dental team has you covered!